Advantages of our CT include a more rapid scan time and a lower dose of radiation. In addition, a CT procedure can usually be performed with a few breath-holds instead of one for each image or slice. As a result, patient comfort and tolerance are increased. 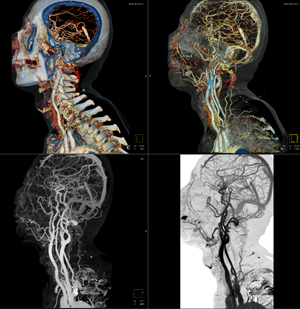 CTA (Computed Tomography Angiography) uses CT technology to visualize blood flow in arterial vessels throughout the body. Areas evaluated with our 64 slice CT include the arteries serving the brain, lungs, kidneys and heart. CTA can also be used used to detect narrowing or obstruction of blood vessels as well as aneurysms and embolism.